NEWPORT, R.I. (October 4, 2017) - Tourists come to Newport for fall foliage and clam chowder. 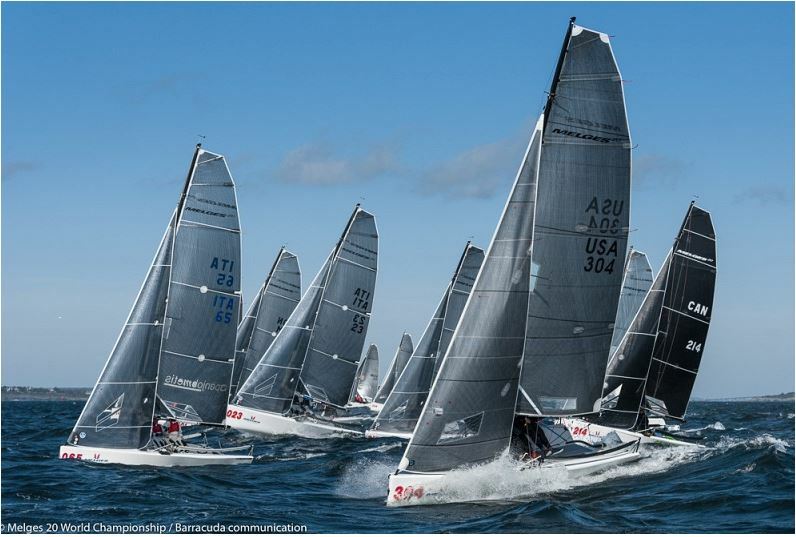 Sailors come for yachting history and the legendary Newport Sou'wester Breeze which arrived on Day One of the 2017 Melges 20 World Championship. 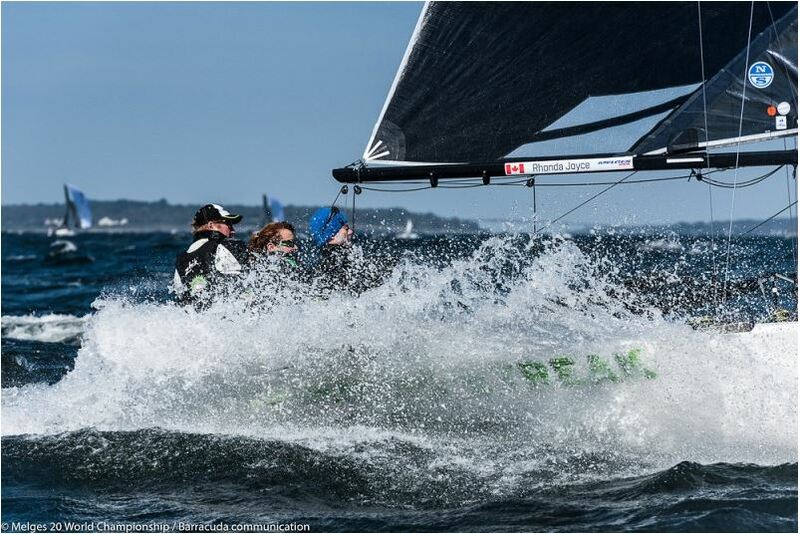 Mixing together warm, sunny fall temperatures, great breeze and near perfect Melges 20 surfing conditions, three races were completed in efficient fashion with Drew Freides' PACIFIC YANKEE holding the overnight lead with an impressive 1, 2, 2. With a plan to start on time, at 11 a.m. eastern time, PRO Peter "Luigi" Reggio sent the fleet to course 'Alpha' or better known as the outside course. With wind at 15-18 kts, 2-3 ft waves and a solid southwest direction, Race One began with a clean start and Friedes leading at the top mark, followed by Igor Rytov's RUSSIAN BOGATYRS, and John Kilroy's SAMBA PA TI. In a duel of leaders of the North American and European World League leaders, Freides showed polished form around the track to fend off Rytov, and making a hard charge for third was Rob Wilber and his team of pork chops on CINGHIALE. Wasting no time, Reggio fired of the warning signal for Race Two and it was Jim Wilson's OLEANDER who tacked off the line and found a nice honey hole in the deep right corner. With a track similar to a Nascar oval, the teams that extended to the right corner on the upwinds and nailed the right corner downwind saw big gains. Wilson would hang on for the win followed by Freides and SAMBA. Wilson commented post race, "We had ideal Newport conditions today. It felt great to win a race here at the Worlds. The racing was close and clean. It was full-on near the top end of the fleet. Lots of high speed action. On a day like today, there's nothing better than going downwind with the kite up!" The final race of the day saw a general recall which was a much needed additional break for teams looking to catch their breath. 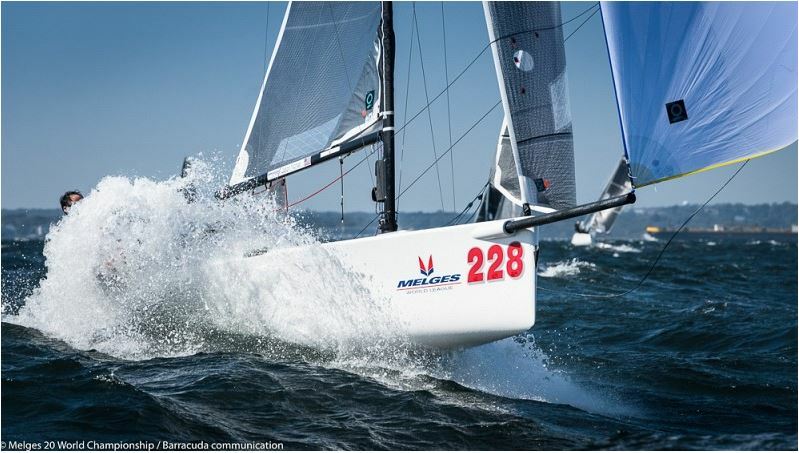 With breeze continuing to touch 22-23 kts, the Melges 20s had a full gallop down wind while surfing big waves and getting the occasional mouth full of salt water. Using the mid-line sag to his advantage, Wilber punched off the line, tacked to port and extended to the right, and played the middle left taking advantage of the first lefty puffs of the day. 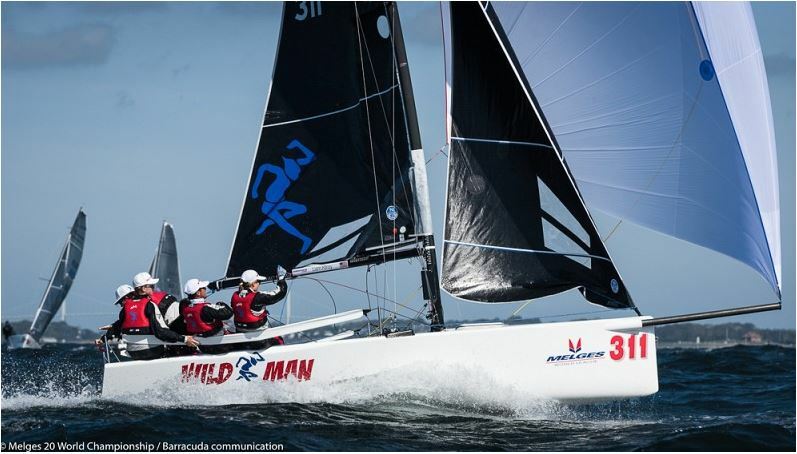 After a brief tussle with longtime Melges 20 owner Daniel Thielman at the helm of KUAI, Wilber managed to hang on for the win, with Freides charging into second and Rytov in third. "We kinda pulled it together on the last race of the day," said Wilber. "We had a great first race, a tough Race Two, but we regrouped to take a bullet in the third race. There's no better way to do that than to go out and win one. We are excited for Day Two." 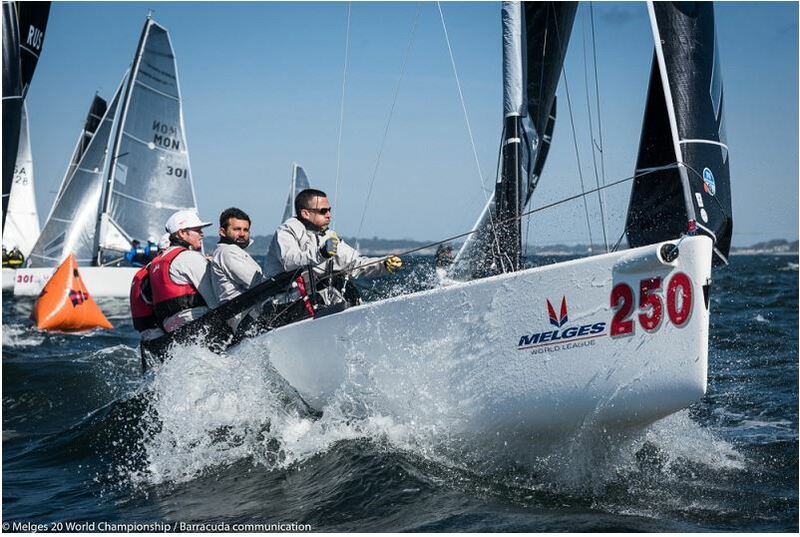 Post racing, Melges 20 sailors gathered at New York Yacht Club Harbor Court sponsored by owners Drew Freides and Rob Wilber, to relax and regale each other in stories from an epic day of Melges 20 sailing. With breathtaking views on the top of the hill at Harbor Court, daily awards were given as teams guessed at whether the race course will remain 'outside' for Day Two, or will the wind and sea state demand that the race course be moved to the 'inside' race course which would present a new set of challenges. Thank you to the New York Yacht Club for serving as hosts, and our chief sponsors Melges USA and North Sails. With a handful of great teams competing in the all-amatuer Corinthian Division the heat is on high early. Canada's Justin Quigg on CHARACTER 2.0 and Brazil's Cesar Gomes Neto on PORTOBELLO swopped leadership places throughout the day. Ultimately, it was Quigg getting the upper hand over Gomes Neto to lead. "Generally we're pretty happy - We think we're in a good spot for tomorrow," commented Quigg. "In the Corinthian fleet, there's lots of trading places back and forth. We're only a few places ahead of the guys behind us right now." Sweden's Johannes Lind-Widestam sailing INTERMEZZO sits third after three races.